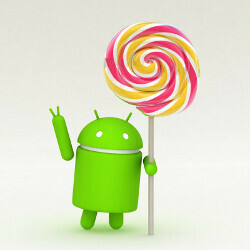 Every month Google releases information about Android versions and their adoption rate among consumers. The search giant uses a simple method to gather the numbers and offer them in a suggestive diagram. Basically, each snapshot of data represents all the devices that visited the Google Play Store in the prior 7 days. It's also worth noting that this data only take into consideration devices running the latest Google Play Store application, which compatible with Android 2.2 and higher. That being said, let's see the numbers for the data collected during a week's period ending on September 5. As it happens, Android Lollipop is in the lead with 45% market share, while Android KitKat comes second at 27.7% market share. There's no surprise that these two Android versions are among the most widely used since they are running on entry-level and mid-range devices. Those high-end devices compatible with newest Android versions have already been updated, but the vast majority of budget-friendly and mid-end phones and tablets are stuck on older versions until owners switch to a newer device. 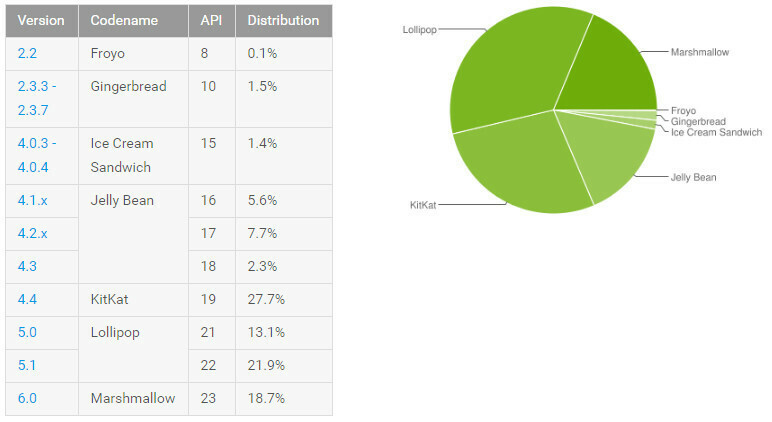 Android Marshmallow is only third with 18.7% market share, whereas Android Jelly Bean accounts for 15.6% market share. Some of the oldest Android iterations like Ice Cream Sandwich (1.4%), Gingerbread (1.5%) and Froyo (0.1%) are at the bottom of the list. Notice the fact that Android Nougat is missing from the data collected by Google, but there's a reason for that. Apparently, any versions with less than 0.1% distribution are not shown, which leads us to believe that Android Nougat's market share is insignificant for now. However, we can safely assume that once major handset makers like HTC, Samsung, LG and Motorola start upgrading their phones to Android Nougat, the new version of the OS will make it in the chart. Pretty sure a lot of those are low-end Chinese branded phones. Yea, the market got spammed with 4.4 chinese phones before and if you check chinese gadget stores you can still find a ton of them. Pretty sure a lot of those are smarter than you, iSheeps. Dude, this is true. You may try Xiaomi Redmi 2, it is MIUI 7 and it still runs Kitkat (Lollipop now if MIUI 7.5). What is wrong with China OEM. :/ Wait to see MIUI 8 are running Android 6.0 or above for all devices. Pretty sure I own an Xperia Z, not an iPhone. Fail harder. They should make these charts based on OEM. That way we will be able to easily avoid those OEMs no one cares about. Pretty sure you are totally wrong. Nothing to do with cheap chinese phones of today. Its simply cause hundreds of millions of android users live in s**tty countries where they still have the same 5year old android phone. You need to understand that huge part of our world lives under the poverty line. Most of last 2 years chinese phones run on at least android 5.x.x, even the super cheap ones. I recently realize there are people that dislike phone update. Quite a few of them are iPhone users. One being one of my relatives, who's iPhone got bricked just recently after iOS 10 release...still hasn't been able to get it up and running. The Android world has to pull their act together somehow: -My Sony gear gets the update to new Android version anywhere between 4 and 12 months after release. -My Nexus 5X received Android 7.0 two and a half weeks after official release. -My two Android Wear smartwatches receive new updates somewhere between one and three weeks after official release. -My iPhone 5c received iOS 10 a few minutes or maximally one or two hours after official release. And it's one of the oldest devices to support iOS 10. Well no duh that Noughat is virtually non-existent, it hasn't been officially released on any phone! LG V20 will be the first to come out with it and that's probably coming out in end October or November.